Proper 8B: Get Up and See What is New! We sort of passed over this part, but at the end of the First Book of Samuel, Saul and his son Jonathan are killed fighting the Philistines and so today we read David’s lament over them. (We don’t really know anything about the Book of Jashar—it is perhaps a book that has long since been lost into history.) It is interesting, though. Saul has been trying to kill David and David has been on the run from him. So, Saul’s death means that David is no longer a hunted man. He now has a clear shot to the throne of Israel. But Saul has many relatives and sons who could claim power with more legitimacy than David. Jonathan, the other one who has been killed, is actually a close friend of David’s. So the lament begins with a call to not share this news with the Philistines, which would give them further cause to rejoice at Israel’s expense. By making this lament, David is placed in the role of a close relative or heir. And here, the relationship between Saul and David changes somewhat. David is now speaking on behalf of Israel. It is just good politics. And his own lament for Jonathan is for a friend that he has lost. But the lament goes deeper than that. It is also a lament for Saul, the man who had tried to kill him. The death of Saul marks the defeat of Israel. David curses the very mountains where Saul has died. So this lament is not only an expression of grief but may also be David’s own realization that he has gone too far. He has lost both his closest friend and his greatest enemy. Everything has changed. And David realizes that the grief he is experiencing is even more challenging. But David also realizes that the grief that he experiences is not private. Any time a community experiences a shift of any sort, there is always some grief. There is even disbelief. Perhaps it is also a commentary on the tragedy of war. Either way, the lament is real. It is from the deepest part of the soul. And it acknowledges that even grief and sadness and disbelief are part of life, part of God. And we are all familiar with the words from this passage, “How the mighty have fallen!” But often we use it almost as a sort of satisfaction that someone has “gotten their due.” Is that really what it is here? It seems to be more shock and disbelief and a sort of question of “What next?” Maybe the “What next?” question is the important thing. Where do we go when the world as we know it has been shattered? Where do we go when, seemingly, for good or bad, we are left to pick up the pieces? Where do we go when all of the characters that were in place before have somehow changed? How do we “fix” it? Maybe the story is about healing, about wholeness, about experiencing those painful and cataclysmic shifts in our lives when God invites us to something new. How would you characterize David’s grief and his lament? What strikes you about David’s friendship with Jonathan? What strikes you about David’s relationship with Saul? What message would this story have for our world or society today? This passage falls within a two-chapter section where Paul appeals to the Corinthians for money to help “the saints”, who are most likely the churches in Jerusalem. He calls the endeavor a charis, which is translated as “generous undertaking”. But the word charis is also translated in other places as “grace” or “blessing”. (It’s the same root as our “charisma” or “charismatic”) So Paul uses it to describe the gifts of the Macedonian churches and presents them as harmonious, of good will, generous, sincere, deeply and fervently pious, and strongly affectionate toward Paul and his coworkers. Then he begins with flattery, essentially trying to convince the Corinthians that they are just as good as the Macedonians. So it appears that getting a congregation to dig deep into its pockets is as old as Christianity itself (and my guess would be that it’s actually older). Picture Corinth as one of the sort of “up and coming” cities by the sea that enjoyed a flourishing economy and a prime spot in Rome’s eyes. So because the Jerusalem “mother church” was poor, Paul urged the more prosperous Corinthians to do the right thing. But, of course, the reason that they are asked to give is because they have been given to in Jesus Christ. Christ gave up everything for them; what portion of their abundance can they do without? He is not, though, falling into the trap of claiming that God should be worshipped with money. There is nothing about “paying God back” or about rewards for our investment in the beyond. In other words, the argument is pretty sound: We’re all in this together. Give what you can. Give what you are called to give. It seems that Paul is not only pressing them to give, but also to realize why giving is important. For Paul, financial stewardship is not gratitude, but about living a Christ-shaped life. Stewardship is really a form of communion in the name of Christ. It is a way of participating with Christ in the building of the Kingdom of God. His passion and his focus is about more than raising money; it is about furthering God’s Reign in the world. He believes that the way believers use their resources—money, time, talents (charis)—is a reflection on their understanding of God, God’s Kingdom, and themselves as children of God. This is not intended to be a stewardship campaign; it is, rather, the way the Gospel is lived out in our community and our lives. It is a vision of a Kingdom that shares resources, shares lives, and, together, brings about God’s vision here on earth. It is not a vision of a world where everyone is the same but rather a vision of a whole balance. Walter Brueggemann contends that the Bible starts with a Liturgy of Abundance. He sees Genesis 1 as praise for God’s generosity. And throughout Genesis, the Israelites celebrate God’s abundance and generosity. Then by Genesis 47, the concept of scarcity is introduced. Pharaoh has all the land except that belonging to the priests. The world has shifted. What will we do now? What is you reaction to pleas for financial gifts? How do you equate financial giving with spirituality? What does the notion of the “liturgy of abundance” versus the “liturgy of scarcity” mean for you? What message does this passage hold for our society today or for us as individuals? Do you think you live more within a liturgy of abundance or a liturgy of scarcity? What does the way we use our resources say about our understanding of God, God’s Kingdom, and ourselves as children of God? Here, the writer of the Gospel According to Mark, inserts one story into another to provide an ongoing theme. Here, when a wealthy man wants Jesus to heal his daughter, he must wait for the healing of a destitute woman. Jairus was highly-esteemed and probably wealthy. He recognizes Jesus and begs Jesus to heal his daughter. So Jesus agrees to travel with him to address his need. But then suddenly a woman appears. She has suffered for twelve years with a “flow of blood”, implying some sort of menstrual disorder. (Now keep in mind, according to the Hebrew laws laid out in our Book of Leviticus, that blood could not be touched and mixed with other fluids, so, essentially, she would have been shunned from society.) She seems to not really understand what Jesus is about; it seems that she sort of has a magical understanding of Jesus’ healing powers. The number “twelve” is always significant—all-encompassing, all-pervasive (i.e. twelve tribes, twelve apostles). Think about it she had to be exhausted. It had consumed her life. And, interestingly enough, the little girl was twelve years of age, the age signifying the onset of menstruation, of adulthood. So, later, Jesus says that it the woman’s faith—not magic, not even miracles—that not only makes her well but also brings her salvation. In the meantime, though, Jairus’ daughter has died. But Jesus admonishes everyone that death is not the final answer. In the presence of God’s healing power, even death does not overtake life. The child is restored to life and is shown to be “only sleeping”. Think about it, though. 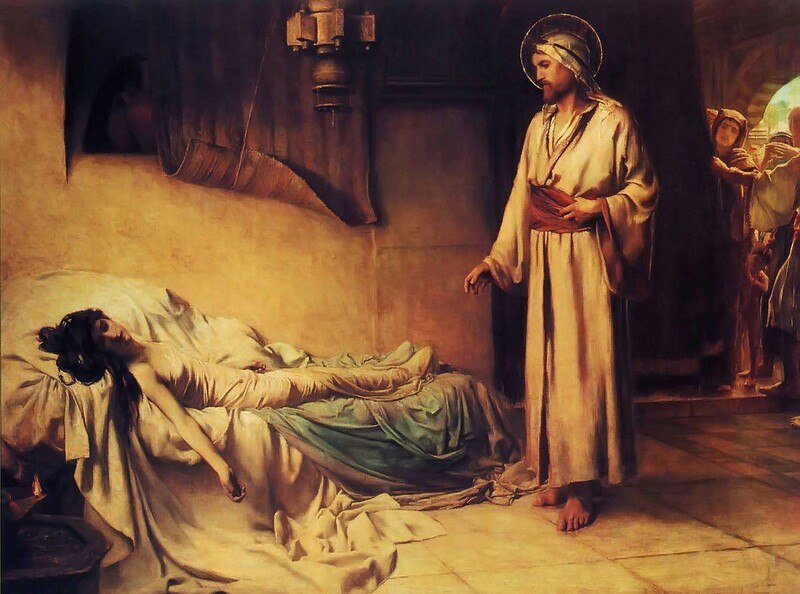 We talk about the great faith of the hemorrhaging women, but what about Jairus? In Jesus’ day, about 60% of live births died by their teens. (And these were the ones who were viably born at all!). AND this child was a girl. At the time, no one really much cared whether or not female children lived. They were really almost a drain on the family’s resources. And yet, this father couldn’t bear to lose his little girl. He was a wealthy leader in the community. He crossed the line of “acceptable protocol” and asked Jesus, who many doubted was even for real, for help. Throughout this passage and, indeed, throughout Mark, the word “immediately” is used. The writer of Mark’s Gospel had a real sense of the urgency of Jesus’ message. But we should not get wrapped up in this passage as one demonstrating that things always end in “happy endings”. Christ is the ruler over all things—time and space, planned and interrupted, and even life and death. Persons of faith will suffer but they will always, through the healing touch of faith in Christ, live in peace and wholeness. That is what healing is about. Think about the faith of the hemorrhaging women. She had the audacity to transgress a whole host of social protocols when she touches Jesus’ robe without permission. And Jairus’ faith, causes him to fall prostrate at Jesus’ feet. These challenge us to examine our own faith, asking how we find the strength to claim God’s promises of healing and hope for ourselves, and how we empower others to do the same. What interruptions get in the way of our faith? What “social protocols” get in the way of our faith?